If you have broke one of your shakers, here is a nice replacement for you. 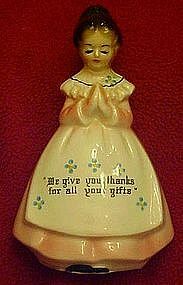 Enesco prayer ladies, or Mother in the kitchen shaker with dark hair and three shaker holes. Measures 4 1/2" tall. Nice condition with no damages, or stopper.